The Ivo 4 Piece Ceramic Bathroom Suite from Premier has a contemporary, stylish design that enhances the appearance of any modern bathroom. Practical and beautiful. 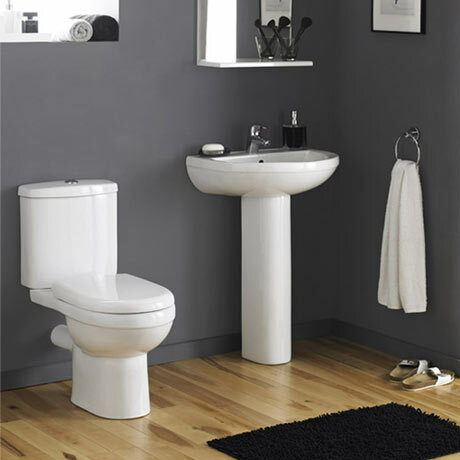 The contemporary styling of the Ivo suite gives a clean modern look for today's lifestyle. All Accessories, Mirrors, Taps and Waste not included. Images are for illustrative purposes only. Q. Premier - Ivo Ceramic 4 Piece 1TH Ceramic Bathroom Suite. Toilet - please tell me the distance from the edge of the soil outlet to the wall, i.e. to the back of the cistern? Everything i ordered was finished to a very high standard and wrapped safely for transportation and everything thing that was included was included thank you. Nice neat and simple sink and toilet combo! Sink and toilet feel good quality, heavier than I thought, and look smart and clean. Not installed yet but very pleased non the less.